I've had a lazy morning so I need to get moving, gotta get my morning ride in on our recumbent exercise bike. I have a lot of issues with my lower back that make walking for exercise difficult right now, but the bike doesn't cause pain, so I pedal away for about 30-40 minutes. In keeping with the discipline I am hoping to develop in my life, a few weeks ago I started to spend less time online. I am not being "noble" or "virtuous" I just was spending way too much time with my face in the computer and not doing other things like reading books, and being creative in my home. I am enjoying still staying in touch with everyone but also being fully present in my real life. I bought some new books with gift cards after Christmas and can't wait to really delve into them. I bought An Everlasting Meal after hearing about it from Brenda. A few weeks ago I started to think of a word for the New Year. My word for 2013 was JOY. It was a good word and the Lord used it in my life throughout the year. Sitting here this morning I think perhaps my word for this coming year is discipline. That doesn't sound as appealing as Joy, or hope or love does it? However, I think it is a good word for me. I tend to be very undisciplined in my daily life. I tend to be very 'go with the flow' and unstructured. This, of course has to do a lot with my learning style. I wrote about it here last January. Unfortunately, this lack of discipline spills into other areas of my life, my eating habits, exercise, spending, managing my household. We have 63 days until Lindsay and Joseph's wedding. To say that mind brain is in full wedding mode would be an understatement! We have a lot done. Flower Girl Dress - check! Plates for brunch and dessert - check! 25 round white tablecloths on loan - check! Meet with floral designer - a dear friend who is offering her skills for free - we will pay for flowers that she will order for us. Meet with Amy who is organizing the brunch - another dear friend. Gather supplies for the reception tables. This is underway! Fun stuff! Right up my alley! Need to decide on flowers or tulle and greenery for the church pews. We need to order jewelry for the bride and bridesmaids. Find a black suit for Tim and Kyle. Order bow ties for ushers, and younger brothers on both sides. So many of our friends and family have lost loved ones this year, including three dear ones who had miscarriages, my cousin whose son died in November, a friend who lost a dear Aunt on Christmas day, and one who lost her mother yesterday afternoon. For me most years have gone by without much loss, for which I am grateful to the Lord. This year has been different. I feel like it has taken me deeper in my relationships with others and with the Lord. So though there is sorrow, there is also a deep joy. Sisters piling on the baby brother in thanks for the cool pocket knives he bought them with his own money. It was a beautiful day. One of our other nieces came over in the afternoon, we relaxed, played games, ate yummy food, played wii bowling, watched the Dr. Who and Downton Abbey Christmas specials. We pondered, prayed and gave thanks. We thought of those who were living with loss this season. Remembering the Reason for our very lives…the reason we can celebrate with hope, Jesus the Christ. 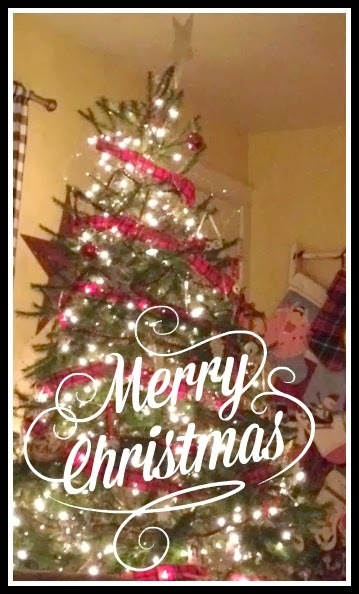 I hope you had a wonderful day celebrating the Gift and the Giver of the greatest Gift! 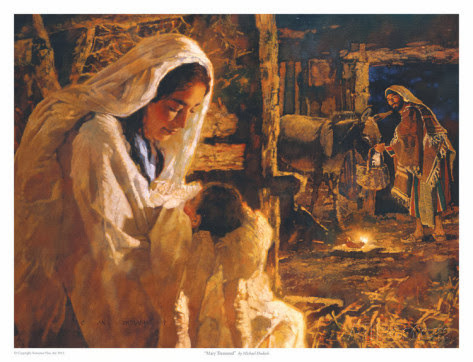 "And she brought forth her firstborn Son, and laid Him in a manger, because there was no room for them in the inn." Today is my sweethearts' birthday! He's the best Christmas present his Mama ever got. That's what he says, and when she hears that she agrees! Last night, the girls and I were up when he got home from work. He was surprised. Then he got crazy hugged by Emma, then Lindsay joined in, then Sarah came out of her bed to join in! (Rachel spent the night with Grandma) They were loud and hanging on him in a giant group hug, saying over and over "Happy birthday, Daddy!" They are a bit nutsy, but he loved it! This morning the family is going to meet up for breakfast and then later whoever is available may go on a hike. I am thankful for this man. He is a gift to our family. I've learned so much about serving others from him. It's his gift, and he is good at it, and always quietly and behind the scenes. Happy Birthday, Tim. You are loved. We had our Not Christmas Eve Service last night. It was a wonderful evening. So many people in ourchurch are musical and performed music last night. It was a real blessing. I am having a challenge with loading video this morning so I'll just post a few photos. There was also beautiful music by Daniel, Nick, Anthony, Jared, Pastor Mike. Becky sang a solo last night, The Coventry Carol, it was lovely. She has a very sweet voice. At the very end of the service, we always sing Silent Night as one of our Pastor's lights a candle from the Christ candle and then in each one passes the light - the gift of God, Jesus Christ - to one another until all the room is illuminated by the Light. It is always very moving to me. I love the beauty of Christmas Carols. They have rich truths in them and I think because we only listen to them once a year, they are very special. It's quiet in my house this morning. Everyone is taking the opportunity to sleep in a bit, before our day gets busy. Tim and I are going to pick up the last few things needed before Christmas day. Then I am taking the younger set to my friend Amy's house in Maryland. We haven't spent a day together in too long, and she and I are going to lunch and will stop by a store she wants me to see! We are both very excited. The kids are excited too! Tim will go with Emily to our nieces' house where he is going to check out a problem with their hot tub! Then he heads to work for the evening and Emma will shop with one of our nieces. Lindsay goes to work today too! The shows at Sight and Sound are sold out! It always amazes me to hear how cranky people are during the Christmas season. Will you pray with me for my Momma? She is going in to have a CT scan at 9:30 am. I appreciate it so much. There is something they need to get a better look at, so they will start here, with the CT scan. She has had some symptoms that could mean that she has ovarian cancer, but we just don't know yet. I am asking that you pray for peace for her, and for clarity in the scan, that it will be a non malignant growth, and for wisdom in how to proceed if it is malignant. I'll update when I know anything. My sister in law had ovarian cancer a few years ago, and did surgery to remove the ovary and then did a strict regimen of supplements and diet. She is doing very well. I don't know what my mom would choose at this point, if it's necessary. Joining Vee today for her monthly Note Card Party! 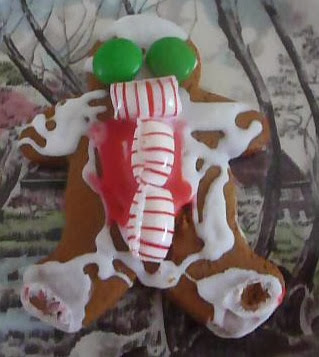 I wanted to show you the lovely gingerbread that the kids made. This is Kyle's Bilbo Baggins. He said the white icing is the spider webs that Bilbo got tangled in. Very creative. Kyle brought this one home for me. It was made by John Michael - age 8. Kyle's house. He decorated the front door with a wreath, he said. Then he went on to mention how the silver balls were just like BB's and maybe they were. I assured him they weren't and that he can't eat BB's. 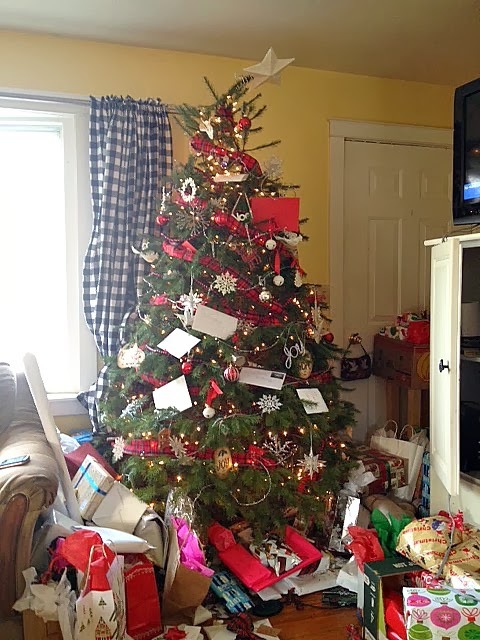 This tree was made by Jane. I think the tiny candy canes are sweet. Rachel ate it for breakfast this morning. This beautiful one was made by Susanna - Joseph's mom. One thing we love at this time of year is TRADITIONS. From when we decorate to making sugar cookies, we love our traditions. Several ladies and I at church yesterday were discussion traditions and what things we do in our families at Christmas time. As we shared I realized that over the years some of the things we did when our older children were young have changed, and we no longer do them. We have replaced them with new traditions. I've learned that sometimes we try to hold on to certain things "because it's 'TRADITION'" and not because it is something that works for us as a family anymore. Sometimes, you just can't find the time in the busyness of daily life to do them, or perhaps your kids have lost interest or perhaps the family dynamic has changed. I say that it's okay! Let the tradition change, if only for one year even. We need to give ourselves the freedom to choose what works for us and doesn't work for us as families. Tim and I took Kyle and Sarah to see the new Hobbit movie yesterday. It was fun to watch them and listen to them. Sarah has read the book and loves it, so she was commenting "that never happened" a lot, but she liked it. Kyle meanwhile was loving every action packed moment and chewing his gum 90 miles an hour in some parts. Seeing their enjoyment made mine all the better. However this was a big grocery week for me, and I really couldn't skip it. Now Fridays are always crazy at Costco no matter what time you go, but yesterday was, well, you'd think that it was Christmas Eve! Tim kept saying, "Is it always like this on Fridays?" I think maybe he was considering hazard pay for me or something! Ha!